The Canadian School of Warsaw, a preschool, elementary and middle school community, is located on three campuses in the Mokotów district. At our school, emphasis is placed on high-quality teaching and learning. Through an innovative curriculum – combining the Polish and International Baccalaureate Organization educational programmes – international pedagogy, cutting-edge resources and qualified, dedicated staff support the learning styles and talents of each student. Our students are encouraged to explore learning – and develop their talents – through a range of transdisciplinary, cross-curricular learning techniques and a wide range of extracurricular activities, including music, drama, sport, foreign languages, entertaining school events and community service. Our school offers a well-rounded, holistic education, which fosters the growth and development of intelligent, globally conscious and caring citizens. Through a healthy combination of respect and appreciation, each and every child and their family members are well known and recognized in our school community. Teachers work closely with students, their families and each other to ensure the best possible educational experience. Students and parents in turn contribute to the school’s management, are involved in decision-making processes and provide ideas and initiatives, thereby helping to enrich our school. Our school is well known for its warm community feel – as well as its strong connection with the community – extensive extracurricular programme, exciting and engaging events, strong moral and ethical awareness and high academic results. On January, 6th 2014, we officially became an authorized IB school nr 005004. The decision to adopt the IB Primary Years Programme at our school was driven by a recognition that it encompasses many of the principles we have long held dear and sought to encourage: a positive attitude to learning and the acquisition of new skills, while developing children’s abilities to ask questions and seek satisfying answers. Likewise, both the International Baccalaureate Organization and our school seek to promote the values of mutual respect, tolerance and understanding toward individuals, groups and cultures in all communities. We deliver the PYP Programme for 3, 4, 5 and 6 year-olds in English only. We teach Mathematics, Science, Language, Arts, Social Studies, Music, Rhythmics, Art, P.E., coding and chess through an inquiry-based approach. In order to give our students a broader choice for their future educational path, in the oldest groups we implement the official Polish Ministry of Education curriculum to prepare our students for passing their School Readiness Diagnosis ( MEN registration number- 398PN). Additionally to develop students’ interests and hobbies we offer a wide range of extra-curricular activities including Karate, Ballet, Dance, Pottery, Piano, Tennis, Acrobatics, Chess, Young Creators Studio, Corrective Gymnastics and Swimming, taking advantage of our unique 580m2 premises, including a large, fully equipped gym, library, Art room and soccer field. The Canadian Elementary School of Warsaw is using a Programme of Inquiry based on international and Polish methods of teaching. On January 6th, 2014 we officially became an authorized IB school (PYP Programme), we are registered with the Polish Board of Education and we are preparing our students for PET (Preliminary English Test), FCE (First Certificate in English) and CAE (Certificate in Advanced English). Our students are knowledgeable inquirers, caring, communicative and balanced young people who achieve great results in both Polish and international schools. We are proud of them! The Canadian Middle School of Warsaw follows the Ministry of Education core curriculum supplemented by the IBO Programme. We conduct classes bilingually: in English and in Polish. The teaching staff is a team of highly qualified teachers focused on students’ individual needs and development. Students take part in numerous workshops and lectures organized by a variety of educational institutions, including Warsaw University. Our activities are designed to prepare your children for life in a modern and changing world. We aim to help students develop full, rounded personalities within a safe, homely environment. We convey knowledge in a manner which shapes young characters, attitudes, and sensitivity, following clear-cut didactic and educational rules. 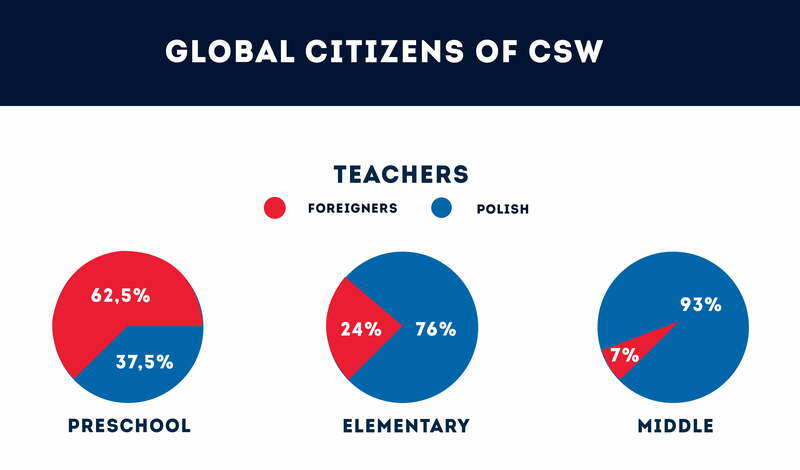 Students of The Canadian Elementary School of Warsaw are exempt from The Canadian Middle School registration fee.